Monty McClaine (Pen name) was born in London during the start of the swinging sixties, schooled in the industrial Midlands of England, and is married with two sons. For some reason Monty had always been intrigued by the following C.S.Lewis quotation, “A children's story that can only be enjoyed by children is not a good children's story in the slightest,” which has, as Monty protests, helped in the formulation of his characters and storylines but did not contribute to his dry sense of humor or his sense of timing. As we all know, computers, electronic games, TV shows and mobile phones and tablets are strongly prevalent in today’s society, strengthening Monty’s belief that some of the natural interactions between family and friends are gradually eroding if not already gone for some. It sometimes feels like the simple joy of laughing or crying among family and friends is being replaced by beeps, bops, and demands to ‘add new features’ or ‘why doesn’t this work?’ or ‘who’s hogging the Wi-Fi?’. With those thoughts in mind Monty set out to create a fun and exciting series of children’s short stories, with lots of adventure and splashes of humor, all paced to hold children’s attention whether reading or listening… at least that is his hope! No sooner had his pen made contact with the paper, even before the ink had dried, Monty had written the title for 12 short "Sam" stories – self-contained episodes if you will – that would hopefully make you, the reader smile, as Monty makes sure that Sam gets into a lot of mischiefs when protecting his lovable McClaine family. Monty hopes that this beginning will be the continuation of a longer journey, where I will be trying his upmost to surpass or at least attain the entertainment desires of today's modern reading audience. 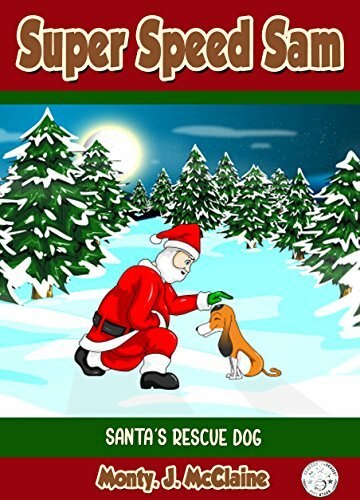 Book 5 of the Super Speed Sam series, referred to by some as Monty’s Christmas special edition, and by others “Santa’s Rescue Dog” finally explains to the reader where, why and whom did Sam get his magical super speed abilities from! Monty hopes you would all follow along with him, as the episodes unfold – perhaps you may have already guessed, or maybe not. Perhaps Monty may surprise you. Fingers crossed. Q: Why did you write the 'Super Speed Sam' series in a ‘12-book series’ format? 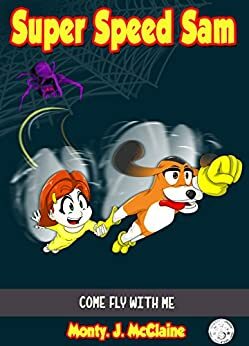 A: Well, the first Super Speed Sam book was actually “Kitchen Decorations” where I hoped to introduce readers to the imaginary world of the main character Sam – that’s the dog. In effect, my thought was to have two stories running in parallel - the main that is the human story, along with the imaginary story of Sam. (Here Monty looks thoughtful, then explains…) So, for instance, when chocolate was being added to the cake mix during Kitchen Decorations in Sam’s mind, the chocolate would be substituted by bones, dog biscuits, and other such things. But, while writing that episode, I decided to extend Sam’s capabilities to include “Super Speed” and with that, the character of Sam the basset hound took a more, er… defined shape! Making special abilities available to Sam, like Doctor, Nurse - even cleaning skills - meant that in effect, Sam’s true, better-rounded character was born. And from there it simply took off – I thought up and detailed out 12 titles for the books, and the rest, as they say, is history. Q: As a writer, why do you think it’s important to have stories that allow children and parents to share thoughts and explore imaginations? A: I am reminded of a C.S.Lewis quotation - The Chronicles of Narnia etc. And I had spent many years as a computer engineer, which is a solitary task - just you and the computer equipment. As we all know, computers, electronic games, TV shows and mobile phones and tablets are strongly prevalent in today’s society. And I believe some of the natural interactions between family and friends these days are gradually eroding if not already gone for some. (Monty looks pensive, eyebrows a little drawn as he goes on…) It sometimes feels like the simple joy of laughing or crying among family and friends is being replaced by beeps, bops, and demands to ‘add new features’ or ‘why doesn’t this work?’ or ‘who’s hogging the Wi-Fi?’. So I set out to create a fun and exciting series of children’s short stories, with lots of adventure and splashes of humor, all paced to hold children’s attention whether reading or listening… at least that’s my hope! Q: What messages would you like your readers to get out of these Sam books? A: Each book shares a simple message – and that’s to play safe and be safe. Now, of course, many episodes have much more than that - some are informative in a fun way! For instance in ‘Kitchen Decorations’ we demonstrate how to clean hands – properly. In ‘Lights Out’ we stress the importance of using the correct equipment to change a lightbulb (lesson for the parents!) and in ‘Kinda Friends’ we emphasize the ‘danger’ of not sharing with new friends – both an emotional and physical hazard as it turns out for young Jack! Q: How challenging would you say it is to write a series of 12 books? A: (Let’s out a long breath and a laugh at the end) I’ll tell you - it’s been quite a challenge and a lot of hard work. Even when I decided on the initial structure of the series, it was still very difficult to maintain the style and ease of reading… and all whilst synchronizing the characters in the same time lines. I love the series, but I won’t deny it was a struggle at times and, again, lots of hard work. Q: So, then for you, what’s the single hardest part of writing these stories? A: As with most things in life, the hardest part is finishing, the easiest part is starting! Crossing the T’s and dotting the I’s, and again, making sure all twelve stories were consistent, entertaining and true within themselves. If anyone out there wants to be a writer, especially of a series, I do encourage you and be prepared to spend as much time in finishing and polishing as you would in writing. And definitely ask for opinions, engage an editor and don’t forget your proof-reader! Q: Wonderful advice. Now, our final question - what have you gathered from your readers about your books and writing style? A: The feedback has been great! (wide smile here) The readers seem to enjoy the pace, style, and themes of all the Sam stories, which couldn’t make me happier! And I’ve had six of the books reviewed by professionals, and they’ve all returned enthusiastic, 5-star reviews – I couldn’t wish for more. Now, some readers suggested that more illustrations would help in the appeal of these books. These are time-consuming, but Sam and I aim to please readers, who are after all the people the series has been written for – so I added the illustrations! 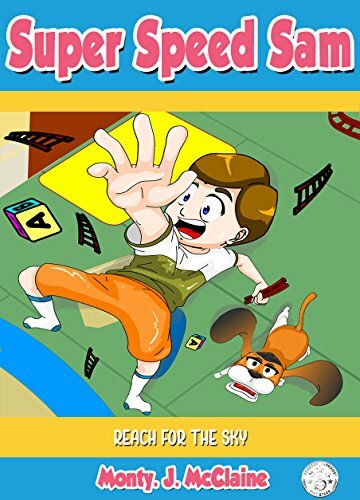 Super Speed Sam is a basset hound and the main character of a series of 12 small children’s animal chapter books that the author has written in his attempt to create a fun and exciting rollercoaster of a story, no matter what the reader’s age! A series of short stories with humor. Stories that build from the mundane to calamitous situations. Stories to be enjoyed by both boys and girls, the young and old, and not forgetting Moms and Dads of course. Stories that allow children and parents to share their thoughts and explore their imaginations. Stories that allow a return to simpler values that may bring families closer together. The target audience is from ages 7 – 12, and for parents or family to read aloud at bedtime or in a classroom for story hour. Each book contains a similar introduction, allowing each book to be read independently from the others, with one exception, Book 4 entitled “Come Fly With Me” where a reading of any other book would help understand this “wacky” episode. 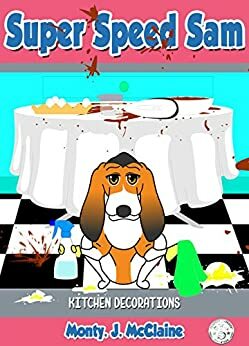 The McClaine family’s faithful basset hound, Sam, knows how to use his super speed abilities, even in a pinch, keeping it top secret from everyone except for baby Molly, of course. What he does NOT know is how these powers started… that’s a big secret, even to him! The story goes back to a long time ago when Sam's ancestor, who also was named Sam, lived with the Brockmans in a small village. Like the McClaines, Mr. and Mrs. Brockman had two children, a boy, and a girl, named Zachariah and Sophie. They were both excited, as was every other boy and girl in the world because it was Christmas Eve. The two of them had strung popcorn and cranberries for their Christmas tree, and then they darned the stockings they would hang by the chimney. Their dad was on guard with the rest of the men in the village in case Mr. Bear, a giant grizzly decided to come back into town. While all this was happening with the Brockmans, Santa, Mrs. Claus and the elves were all busily getting Santa’s sleigh packed up and the reindeer ready for their big day. Sam knows that his super speed abilities is a ‘family thing,' having been passed down through generations of ‘Sam’s’ from long ago, he doesn’t know why, where, how or what got these amazing abilities started. Well, hold onto your seats because, in this extra special Super Sam episode, you’re about to find out! Whether following Santa and his reindeer on their highly eventful Christmas Eve journey, discovering a special ‘sleigh recovery’ team of elves or meeting Sam’s great, great, great (add a whole bunch of ‘greats’), you won’t be able to put the holiday special down! Find out if Santa gets permanently ‘stuck’ and if Sam’s ancestor is able to control his newfound super speed powers. Will the Recovery elves – or Relves for short, the well-trained elf 'sleigh recovery team', be up to saving Christmas, or are they to ‘rusty’? Can Mrs. Claus keep it together when she discovers a possible disaster with Santa? And, on top of all that, will the quiet old village, home of the Brockman’s and Sam’s ancestor, be attacked by the great grizzly bear? Would Santa remember his beloved Mrs. Claus reminder that he was to use his handkerchief if he sneezed? After all, we all know that ‘cough’s and sneezes spread disease’s’ – but why the constant reminder by Mrs. Claus? What is the importance of Santa’s handkerchief, especially on Christmas Eve? And would Santa remember? Would Santa's mission to give toys and gifts to all the children in the world succeed? Well, sometimes even the most carefully planned events can go wrong, and in this case, Santa was able to save the day with the help of his very important rescue dog.